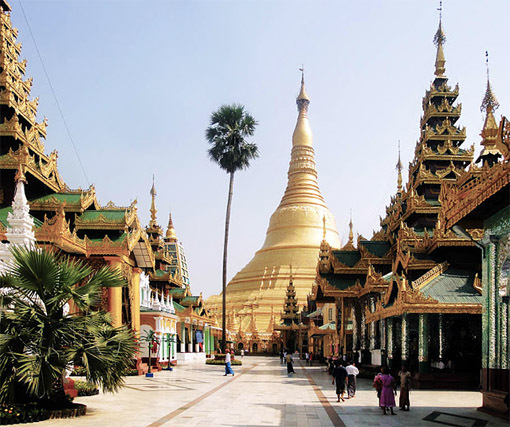 Surrounding the main Shwedagon stupa in a circular layout are 72 small stone temples and shrines each with one and more Buddha sculptures inside. In between are images of lions and elephants, Nats ( the ghost's) and Bilus ( terrifying demons ). The corners of the first base of the stupa are guarded by sphinxes and for "protection" are still 24 Chinthe figures six on each side plus some naga. In the line with the geometric layout are the axes opposite the entrances and four Tazaungs this are halls which are crowned with multi-story roofs They are richly decorated and inside are the most revered of the Buddha sculptures where devotees are meditating and praying. Although the "Buddhist World" is more fragmented than Christians and Muslims this sacred shrine is probably the most famous among the devotees. The real dimension one can see is after entering the platform since the main stupa is only one among many, although it is the biggest. There are countless smaller shrines in the usual colors yellow, gold and white. How does the stupa look today? Its a rectangular platform with a dimension of 214 x 275 meters, extending from north to south, and is about 25 m over the flat terrain surrounding it. As usual in Myanmar four stairways lead to the platform, which are aligned with the axes of the central stupa and covered with tiered roofs which is the typical Burmese platform architecture. The western entrance has 175 steps; at the south side is the shortest with 104. The structure is terraced with a bell shaped top indicate the slopes of Mt. Meru, the abode of Hindu gods. The monument is a symbol of Buddha functions as a big protective chamber, the main difference is into a temple you can walk in, into a stupa you cant.